Some of you might have heard of the infamous parasitic barnacle Sacculina carcini which infects crabs and take over their bodies. These barnacles are true body-snatchers in every sense - they divert the host's resources for their own growth and reproduction, and by doing so they end up castrating their host. Additionally, some can also can alter their host's behaviour, making them unwitting babysitters for their eventual spawn. (A) Shrimp infected with Sylon hippolytes; (B) Internal structure of infected shrimp show its nervous system (n) and the interna (i) and externa (e) of Sylon; (C) Close-up internal view; (D) Close-up internal view with colour-marking. While it sounds like a gruesome fate for the host, parasitic castration is a very clever way for a parasite to get the most out of the host without killing it. While the host can no longer reproduce, and thus dead from a evolutionary perspective, it doesn't need its reproductive organ to stay alive, but instead it now serves as a walking life support system for the parasite - a walking dead. So just how big can these body snatchers get in comparison with their host? The two species they compared were Sylon hippolytes which infects the shrimp Pandalina brevirostris, and Peltogaster (featured in a previous post on this blog) which infect hermit crabs. They collected specimens of both parasites (and their hosts), and prepared them for scanning. 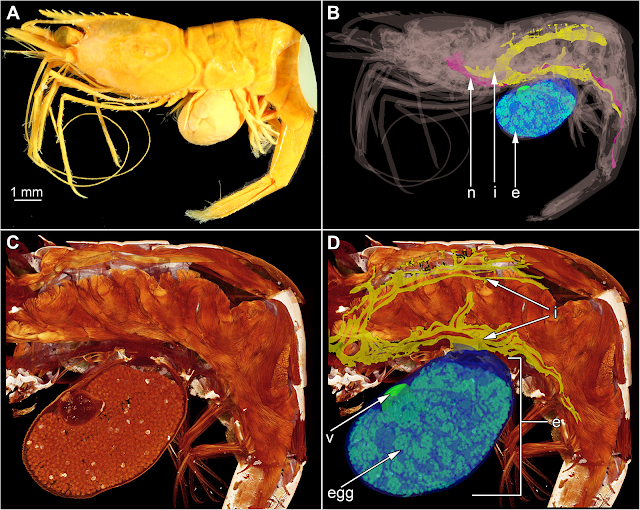 After putting the prepared specimens through the micro-CT scanner, they used special software to calculate the parasites' volume and were able to construct a 3D computer model of each parasite along with the internal anatomy of their hosts. Additionally, they also counted the number of eggs produced by each parasite, and for both species, it seems bigger hosts means more parasite eggs. Both Peltogaster and Sylon grew to about the same size in proportion to their respective hosts (17.78% for Peltogaster, 18.07% for Sylon). But the key difference lies in how much of that mass is distributed between reproductive externa versus the interna root system in the host's body. The shrimp-infecting Sylon devoted the bare minimum to its interna which is only about 2.5% of the volume of its externa. In contrast, the interna root system of the hermit crab-infecting Peltogaster was about one-fifth of the volume of its externa. So why is there such a massive difference between those two species since they parasitise the host in a similar way? The answer lies in their respective reproductive investments. The Sylon specimens measured in this study had about 1400 to over 22000 eggs, and to produce all those eggs Sylon has to devote a lot more of its mass to its reproductive tissue. In contrast, Peltogaster produced a comparative modest number of eggs, only 371 to 4580. But why does Sylon put so much into egg production while leaving the bare minimum to the part of its body which is actually embedded in the host? The main reason is that Sylon only gets one shot at breeding - it only ever produce a single brood in its lifetime before it withers away, so it has to make the most of it by having a massive externa. In contrast, once Peltogaster becomes established in a host, it spawns repeatedly and grow a new externa each breeding season, and in order to do so, it needs to invest in a robust network of tendrils which will stay in the host for good. In this sense, Sylon has a "YOLO" approach to host exploitation and reproduction, whereas Peltogaster is in it for the long haul and so devote more of itself to establishing an extensive root system inside the host. This also has important consequences for the host as well since both parasites places such a massive burden on their hosts - while the demanding presence of Sylon will eventually come to pass, Peltogaster is a persistent body-snatcher that's going to stick around for quite a while. Nagler, C., Hörnig, M. K., Haug, J. T., Noever, C., Høeg, J. T., & Glenner, H. (2017). The bigger, the better? Volume measurements of parasites and hosts: Parasitic barnacles (Cirripedia, Rhizocephala) and their decapod hosts. PloS One 12(7): e0179958.